Manager Mixu Paatelainen has made his first Kilmarnock signing, snapping up winger David Mendes Da Silva on a two-year contract. The 23-year-old is a product of the Porto youth academy and was released by Bulgarian side CSKA Sofia last month. "He's an attacking midfielder and he adds to our options up front," Paatelainen told BBC Scotland. "He's been training with us for a couple of weeks and has done well. He's quick and comfortable on the ball." Da Silva spent the second half of last season on loan at Deportivo Castellón in the second tier of Spanish football, having moved to Bulgaria in 2008 with Lokomotiv Mezdra and joining CSKA a year later. 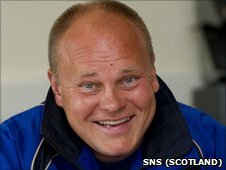 Paatelainen inherited a threadbare squad when he arrived in Ayrshire last month and aims to add a few more new faces in the coming weeks. The Finn is closing in on the signature of a defender and has several other irons in the fire as he juggles a small budget. "We hope to announce the arrival of a centre-half early next week, maybe Tuesday or Wednesday," he added. "And there will be more business done before we kick off the season."